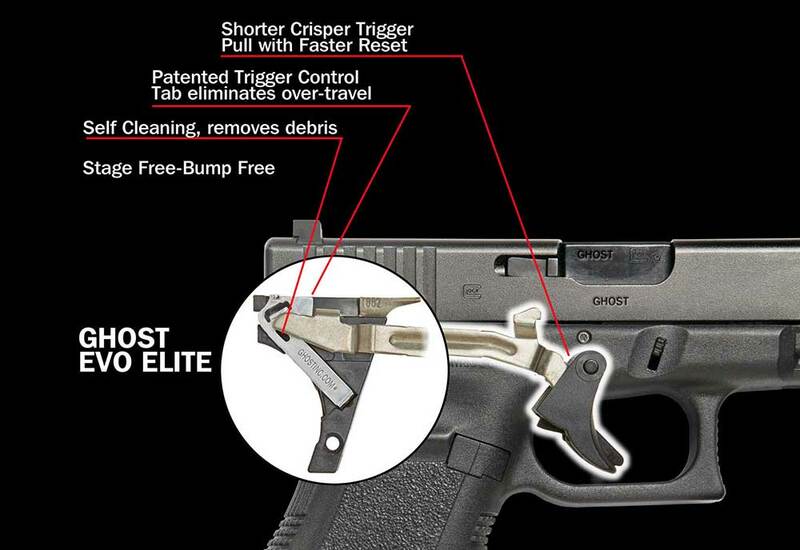 Ghost Inc., is the manufacture of the best self-defense trigger connectors and accessories for your Glock pistol. Established and made in the USA since 2000. Everything Ghost production comes with an unconditional lifetime warranty and guarantee. They will exchange or replace any Ghost made part regardless of fault or reason for life! Thank you for the opportunity to gain and preserve your business. The EVO ELITE, PRO 3.3, ROCKET 3.5, TACTICAL 5.0 and the PRO for 42/43 are the Ghost Trigger Control Connectors that feature the Patented Trigger Control Tab (TCT.) This tab is fitted to your Glock and shortens the overall duration of the trigger pull and removes accuracy robbing trigger over-travel. The TCT gives you a shorter faster trigger pull and keeps your shots on target. These TCT connectors are the only trigger parts you need to purchase. You decide your trigger pull weight either 3.5 pounds or 5.0 pounds, either is legal and suitable for self-defense. Trigger Control Connector made from stainless steel is unquestionably the preferred set-up for many shooters. There are no screws to come loose and shake your gun. You don't need to purchase a trigger home and a 3.5 pound or 5.0-pound connector to get a fantastic custom trigger pull, just one of those with the TCT. Except for the G42/43 Pro, these Trigger Control Connectors all possess the Patent Pending Debris Channel(s) or holes. Why is self-cleaning so significant? Since as you fire your pistol debris builds up on the trigger mechanism surfaces. These debris cause additional friction. This friction increases the weight of the trigger pull which increases the force applied to the connector. As the trigger pull weight increases, the connector is pushed towards the rear of the trigger home eventually far enough that the pistol will not fire! The stations reduce the depth of the connector body. These reduction increases refresh speed, and because these stations are located on the centerline of the connector body, they don't cause connector torsioning. The holes remove activate peeled debris from the trigger mechanism ensuring your Glock keep shooting no matter what you get it into. Ghost Inc. Trigger Control Connectors and Trigger Connectors are the only ones that are self-cleaning and make your Glock longer reliable-Why settle for less.